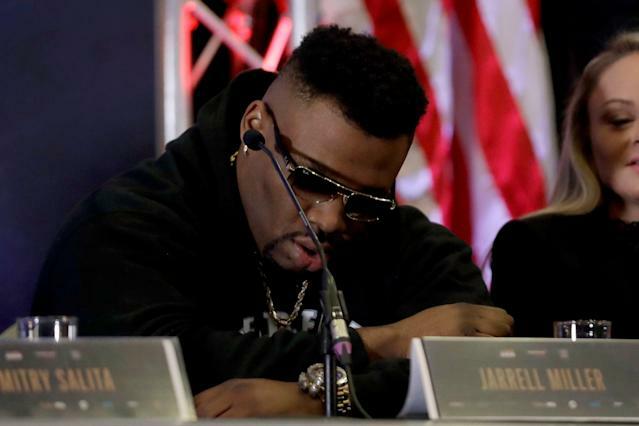 Jarrell Miller’s fight against heavyweight champion Anthony Joshua will not proceed as planned after reportedly positive for a banned substance, according to Dan Rafael of ESPN. "I am on the search for a new opponent," Hearn said. "Literally anyone can get it. There are some names that would appeal to our partners -- DAZN, Sky Sports and Madison Square Garden -- more than others and it's our job to get the ones that appeal most. I've spoken to 16 heavyweights in the last 24 hours, 10 of which are not suitable." Rafael was able to confirm that news with three sources. Miller reportedly tested positive for GW1516, which is a doping agent with some dangerous side effects. The news takes on a heavy dose of irony considering that Miller himself accused Joshua of taking performance-enhancing drugs at their first press conference. Now, the accuser is losing the fight for the same charge he levied against his opponent. The 30-year-old Miller was set to take on Joshua for multiple titles — including the WBO heavyweight title — at Madison Square Garden in June. Miller, who goes by the nickname “Big Baby,” reportedly submitted the positive urine test March 20. Joshua, 29, was putting multiple titles on the line to take on Miller. The matchup was going to be Joshua’s debut fight in the United States. Joshua is British, and has mostly fought in the United Kingdom. Miller holds a 23-0-1 record while Joshua is 22-0.